were uniformly unattractive. Most looked like an ill designed bed with a packing crate slid in below it. to accommodate the bottom bed without it appearing to be an afterthought . 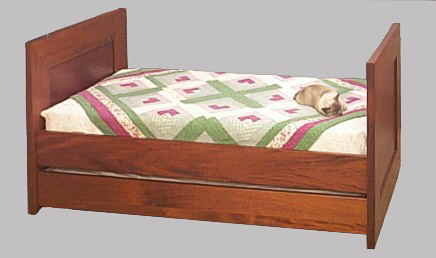 The solid head and foot boards hide the mechanisms necessary to allow the lower bed to be slid in and out easily. The size of the side rails has been increased to remain proportional to the ends. we have hidden all outward appearance that the bottom contains another bed. 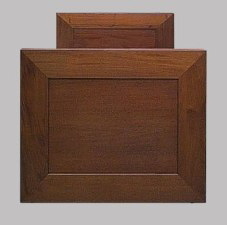 The ends are each a large frame of thick Mahogany. we must special order material that has an " A " grade back as well as front. We have increased the thickness of the side rails to 1½" in order to further strengthen the entire framework. sliding mechanism. Their hardness and strength allow the slides to be secured with no fear of weakening. There is a full set of slats to hold the bedding in the trundle, just as in the bed above, and both are screwed to the supports for added strength and rigidity. Finding the sliding mechanism was the key to our proceeding with this project.The best description is that they are huge drawer slides. The purported use for them is on the storage drawers of museums that may contain large collections of rocks, fossils, or other very heavy items that need to be accessed on a continuous basis. so there is no compromise in space available in the trundle. The slides are massive. Each of them weighs nearly 20 pounds. But, they are of a quality and precision that is not found in most commercial hardware. They are effortless and smooth beyond belief in their operation. Any one of any age or strength can slide the trundle out with little effort. The bedding requirements for the top bed and trundle are easily handled with available materials. The top bed can be used with, either a mattress and box spring, a mattress alone or a futon. It is admittedly a bit taller than the traditional modern bed. That is because the design is from an era when being up higher meant being warmer and out of drafts. If a bed height similar to a modern bed is desired, one can use a 8" or 10" mattress alone. The use of a thick mattress and foundation still fits the overall height of the head and foot boards, and in some ways accommodates and enhances the design parameters of the original bed from which it is patterned. The bottom trundle can only use a futon or high quality mattress that is six inches thick. We recommend that a quality futon be made to fit the box. It can be the same width as any bedding for a twin bed, that is, 39". It will, however need to be three or four inches shorter than a standard twin mattress. the approximate length, INSIDE THE TRUNDLE is 72" rather than the traditional 75". If one chooses to use a futon, the length can be gained by compressing the bedding a bit. This is easy, with a futon, due to its flexible nature. If one uses a mattress, it will need to be made special the proper length. This can be done locally, or we can have one made by a quality manufacturer that we use. It is hard for me to believe our complete turn about concerning this bed. We were adamant in our refusal to make it originally. We are now extremely proud of the final effect. More than that, I can wholeheartedly endorse it based on the quality of its construction. Not a single thing has been sacrificed from quality and durability to achieve the final effect. 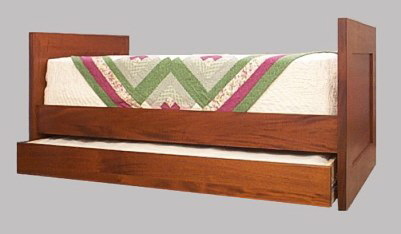 This bed will last for many decades and operate smoothly throughout its life. If you're interested in the Trundle Bed Unit as a stand alone unit, follow this link for more information.